Some have suggested using the amount of time you have spent creating that art piece, and then using your hourly rate to project an estimate pricing. If your hourly rate is $125, and you have spent 4 hours creating the art piece, then the estimated pricing would be approximately $500. Fair and square. Framing would cost somewhere $100-$150 depending on which vendor you went to. If we take framing cost to be $100, then the new projected pricing would be $600. We need to put in logistics and administrative cost at $100, that would result in a new pricing of $700. A gallery would take at least 40% of the sale, so after factoring this in, your new pricing is going to be $980. Adding another 30% for your fame and reputation after winning an award recently, your grand total is $1274, while rounding this off to the nearest whole number would result in the final new pricing of $1280 or $1300 for your artwork. A 60% increase from the original pricing of $500. The value of an artwork is equal to the amount a buyer is willing to pay for it. Not forgetting that some customers would want to ask for the best price or a discount. 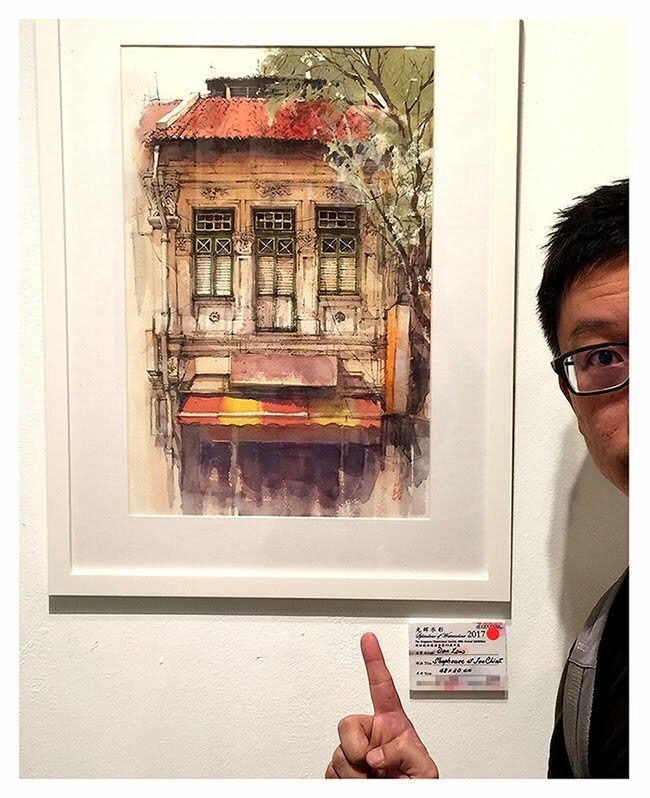 This year's Singapore Watercolour Society's annual show was a special one for me. Because both of my exhibited pieces got sold. My pricing was based on common practice according to the size but I priced my work a little lower that the accepted range for a half sheet watercolour paper size. My reason, SWS takes only 20% of the sale price, coupled with the fact that I want to make my art a little more affordable. In fact I was pleasantly surprised to see my paintings sold. 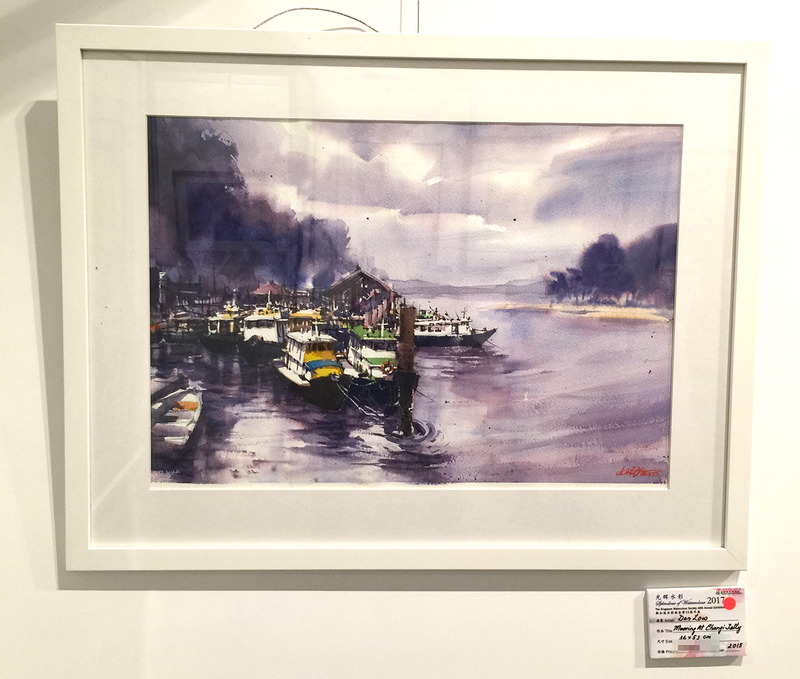 Not my first time to sell my paintings though but the first to have my paintings sold in the annual exhibition. Then I was a little sad to see them go too. 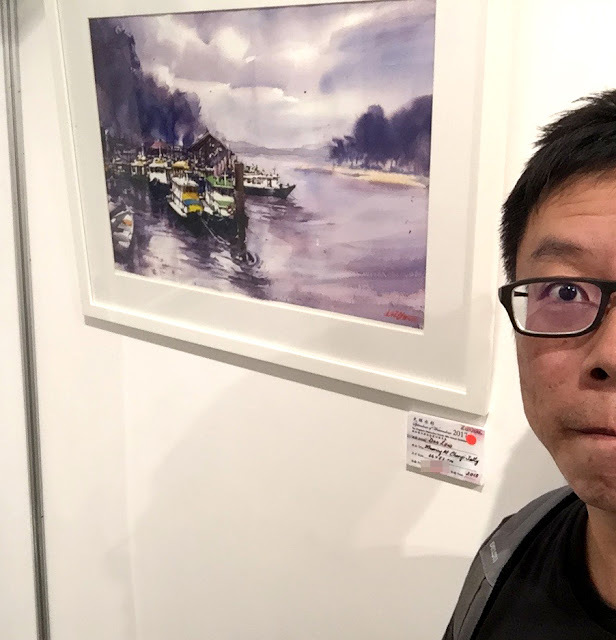 And this is me taking selfies with my paintings on the last day of the exhibition. My most recent sale was a painting I did in 2012. 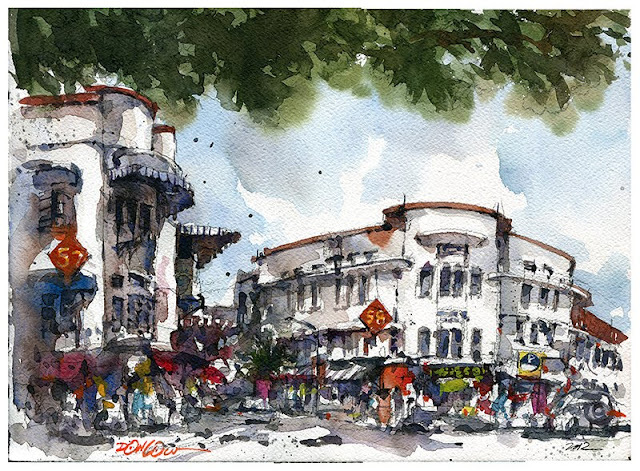 A plein air done in Tiong Bahru. It was also exhibited at a gallery along with 3 other artists. 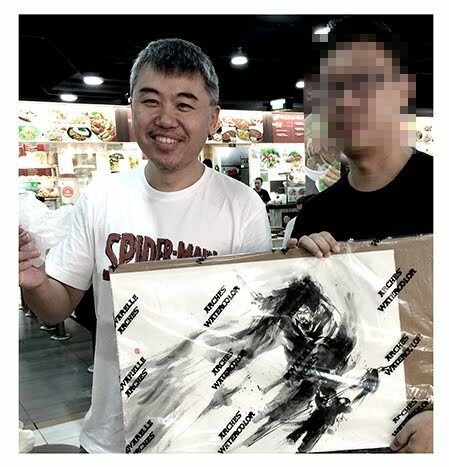 Most of the sketches and paintings exhibited were sold out. I was left with a few unsold ones that I gladly display in my home. Then there was an enquiry and then it is going to be in someone's possession. I am happy for it to find a buyer who wanted to give it as a birthday gift to her husband. And I hope the buyer would be happy with her purchase.